What Actually Happened at the Lincoln Memorial? On January 18th, 2019, students from Covington Catholic High School, from Covington, KY, were taking a field trip to Washington D.C. to attend the 2019 March for Life. As they were standing at a bus stop at the Lincoln Memorial waiting to go to the March for Life, they were approached by a group of older individuals known as the Black Hebrew Israelites. These men began shouting out insults directed towards the President because of the MAGA hats the students were wearing. One of the members of the Black Hebrew Israelites mentioned how, “you have in God We Trust on the back of your dollar bill it says In God We Trust, and you give f*ggots rights. The Bible condemns homosexuality, man.” The sheer bigotry and hate of this group of individuals is unacceptable and yet many people have seemed to focus their attention towards the group of Native of Americans that approached the crowd of high schoolers. This group of individuals approached the crowd of high schoolers in hopes of “relieving the tension” between the Black Hebrew Israelites and the high schoolers. Nathan Phillips was the Native American that approached the high schooler and beat his drum in front of him. 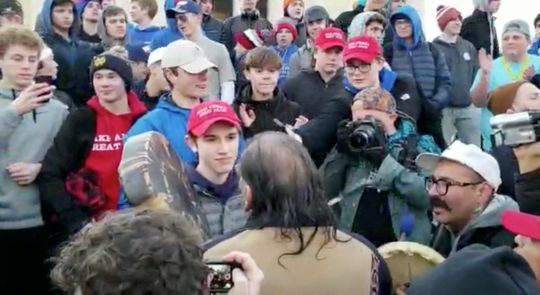 Many media outlets jumped to the conclusion that the Covington Catholic High School student, who has been identified as Nick Sandmann, is the one who instigated the conflict between the Native American group and the high school students as he approached Nathan Phillips. Based on the two-hour video published on YouTube the day the event transpired, in the video, Nathan Phillips approaches the crowd of students and pushes his way through to then get in the face of Nick Sandmann. Phillips claimed that the students were chanting “build that wall,” but that yet to be determined according to other sources. In other news on the situation, the media has recently been labeling Nathan Phillips as a Vietnam veteran based on what Phillips had said in a CNN interview. His comment on the crowd of high schoolers was “I’m a Vietnam veteran and I know that mentality of ‘there’s enough of us we can do this’.” This was disproved soon after the publication of the CNN video interview. Retired Navy Seal Don Shipley had published a video on YouTube, as of three days ago, exposing Phillips’ military records showing that he did not serve in combat overseas. Shipley went on to find that according to the military records documented on Nathan Phillips, he served as a rifleman for two days and as an electrician for the year of military service that he had spanning form 1972-1973. This was 1-2 years after U.S. troops were pulled from Vietnam so Phillips couldn’t have served in Vietnam. The high schoolers seen in the video have been threatened by journalists and celebrities as of recently. It is yet to be determined if these journalists should be facing a lawsuit. Further information is being distributed on the situation in interviews with the high school students on their perspective.